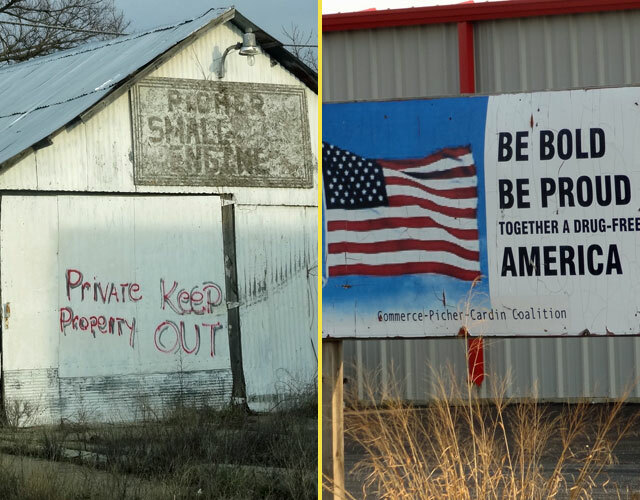 As recently as 2006, Picher, Oklahoma was a typical little American community. Now it’s a toxic ghost town. The GPS urges me to continue going straight ahead, but I’m unable to oblige, thanks to a wire fence blocking the road and a daunting sign reading, “U.S. PROPERTY, NO TRESPASSING.” Huge rock piles, some as tall as 200 feet, surround my car on nearly all sides as I navigate a maze of narrow, one-way streets through what used to be a residential community. The rock piles behind the fences are not merely rocks. They’re chat, a toxic mixture of stone, lead and iron, the remnants of decades of mining expeditions. The chat piles are scattered throughout the area and the toxic dust blows in the wind, carrying the hazardous material along with it. Fortunately, it’s not a particularly windy day, so I (perhaps naively) don’t fear for my own health. I’m not even aware that the ground I’m standing on is extraordinarily unstable and could collapse at any moment. As I look around at the abandoned buildings and observe what’s left of this place, I’m in awe of the shockingly swift decline of the community. 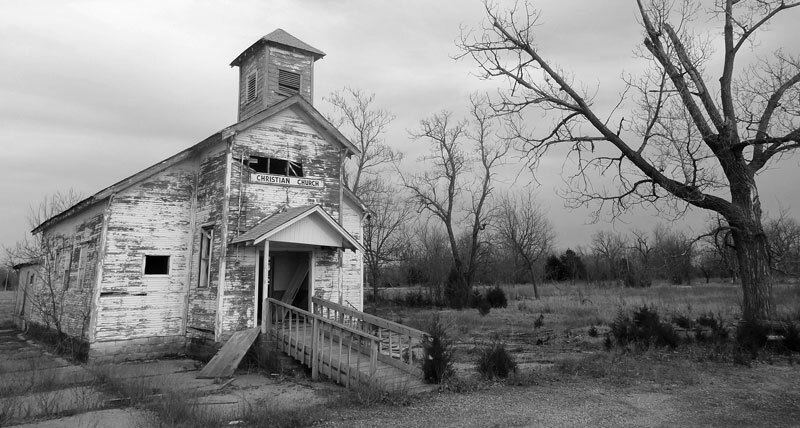 As recently as 2006, Picher, Oklahoma was a normal American small town, with more than 1,000 residents and a school district of 340 students. Just three years later, every resident had received a buyout check from the federal government, along with a warning that they’d better high tail it out of town ASAP because Picher was a toxic dump affected by lead contamination. Everyone is gone now. Visiting this place now is freaky. Ghost towns can be fun, especially places like Rhyolite, Nevada, which was abandoned nearly a century ago and has become somewhat of a tourist attraction. But Picher’s story is far different. The town was founded in 1913 after workers drilling a hole accidentally discovered lead and zinc. A mining company set up shop, bringing to the region thousands of workers who established Picher, Oklahoma and the nearby town of Treece, Kansas. The area became a mining mecca, producing most of the metal for the ammunition used in the two World Wars. As the decades wore on, the mining stopped, but the ground became extremely unstable. Mine shafts would occasionally collapse, sometimes sucking in entire houses or cars. A 2006 report by the Army Corps of Engineers revealed that much of Picher was facing major sinkhole danger due to mine subsidence. An earlier study had revealed that 34% of children in Picher had elevated levels of lead in their systems, resulting in the potential for brain damage, so Picher was not exactly topping any “most livable cities” lists. The government finally shut down the town and offered buyouts for its citizens to begin life anew elsewhere. Most locals were ready to leave, and a majority of those who were still undecided moved on after a 2008 tornado that further devastated the community. In 2000, the population of Picher, Oklahoma was 1640. In 2010, it was 20. Today, it’s zero. Such a dramatic change due to the mine issues and chat piles and lead contamination. What’s it like to visit a toxic ghost town? Being in a ghost town that was abandoned so recently is strange. It’s odd to see the Picher Youth Soccer sign and realize that just a few years back, kids were playing games on this field – a field that is one of the most unstable parts of the entire town, according to that Army Corps study. While the chat piles are fenced off, the rest of the town is still publicly accessible. Ignorant of the unstable ground on which I’m driving, I cover just about every inch of the small community’s roads, checking out the old Christian church, the water tower, a housing complex, an empty phone booth. There’s absolutely no one else on these side streets, though several Kansas-bound cars do zip past on Route 69, which runs through the heart of what used to be Picher’s business district. Most of the homes are long gone, but a few remain as hollow shells. There’s very little color left. Everything is brown and gray, just dead foliage and concrete roads and parking lots. Leafless trees and dry weeds have taken over the landscape. The only splash of color is the bright red base of the giant gorilla mascot, which informs me that the Picher Gorillas captured the state football championship in 1984. A modern “Neighborhood Watch” sign stands hopelessly next to an abandoned, broken-down dwelling, while a “Drug-Free America” post survives next to the drug store. 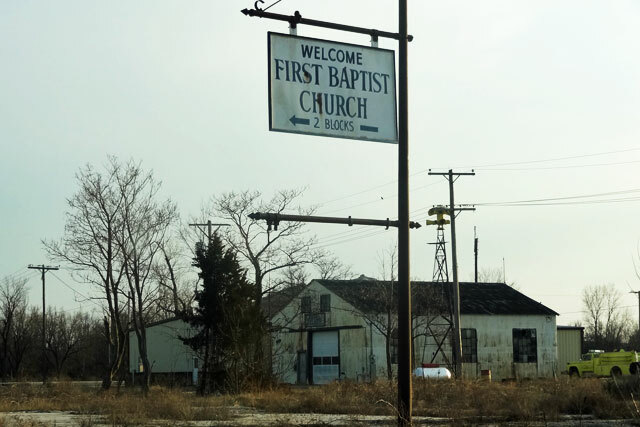 Another sign points the way to the nonexistent First Baptist Church, which was torn down in 2011. “Keep Out!” is scrawled in spray paint across most of the properties, in an effort to keep ghost town tourists such as myself from entering the old buildings. And perhaps to keep away meth heads. Yeah, that too. Meth dealers evidently moved into some of the abandoned houses for awhile after the town was deserted. “Surreal” is not a word I’ve used to describe many places, but it could not be more appropriate here. 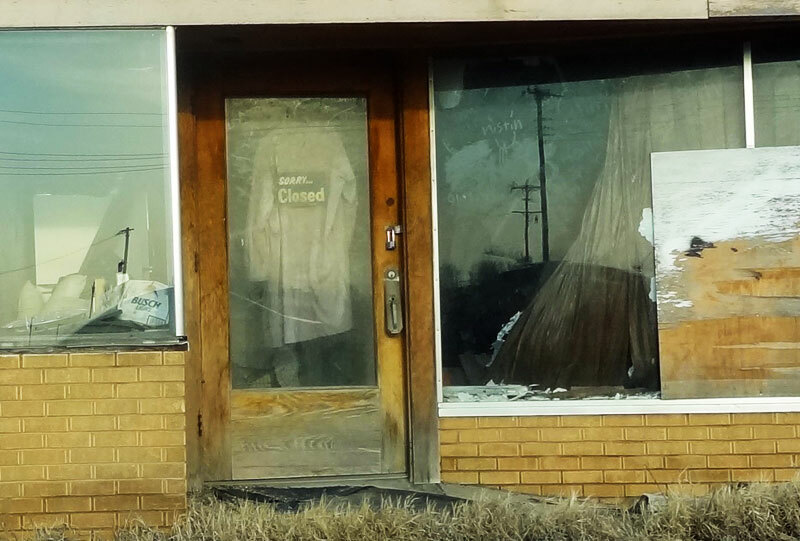 The lead contamination in Picher has led to a truly strange abandoned place. 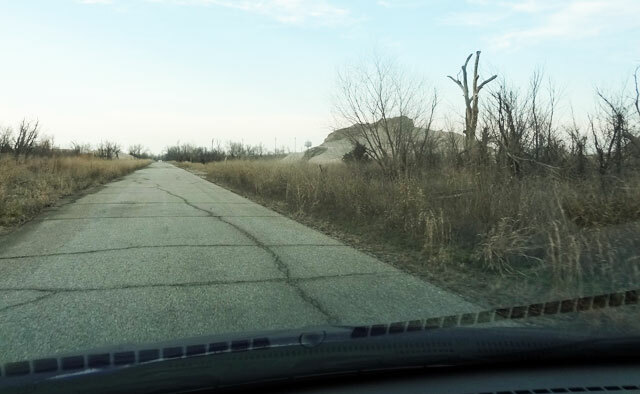 The main road leading out of Picher remains a highly-traveled artery connecting Oklahoma to Kansas. There, the building that housed the Picher Mining Museum remains intact, serving as a reminder of the industry that both created and destroyed the town. Can You Visit Picher, Oklahoma Today? Yes, you can still visit the town, just as I did. Some side roads are closed (due to chat and sinkholes) but the main road that runs through the community still exists and will still take you past town into Kansas. There aren’t a lot of hotels in the vicinity so Picher is probably best for road trips. You can pass through this strange ghost town and then keep moving onto your next destination. I grew up in Picher, and miss home every day. I just wanted to give my answer to the questions posted by Carly Adams. The land in Picher was turned back over to the Quapaw Indian tribe, they were the original settlers in that area. After the residents that chose the buyout were gone and the houses removed they were given back the land, the school building was blocked off by them, I am not sure what it is used for. Also, it was said earlier that “police run people off”, it’s not because there is anything secret going on. It is to keep unnecessary vandalism and nonsense like that from going on. There are still people that live there, it was their choice to stay, I sometimes wish I could move back home, it was a great place to grow up. I don’t know all the answers to the whole situation, but I have my opinion, I feel that there were some health issues brought on by the exposure to the lead. I just don’t believe that every person that has ever lived in Picher has these issues. As far as the roads “falling/caving in”, there is a chance of cave in but not anything like the way you described it. Hell for that matter, if that was true, you had better be careful driving around the nearby towns of Commerce, OK., Quapaw, OK. and as far away as Joplin, Carthage, Galena, and Riverton, in Kansas. All of those areas were active in the same mining that took place back in the day, along with Picher. I have always heard the old story, from my Uncle, that there was a place around Commerce, where you could drive a dump truck under the ground into the tunnel that lead from there all the way under ground to Joplin, Mo. So, in the end, if Picher had big troubles, then why not those areas also? I just visited picher OK and the surrounding towns, I was just wondering if anyone can tell me why the school is blocked off by police, it was almost like they were hiding something there? Just drove thru this town tonight when we had missed our exit. It is very erie. I would love to hear more of this story. I remember hearing of the buyouts an of the tornado and I remember when my brother told us he could not go to picher an ride his four wheelers on the chat piles anymore. Very interesting to drive thru here today, I had never been to pic her before. My question is, what is the large acres of newly worked land that appears like a new development coming soon just north of picher? Good question, Russ. North of Picher is Treece, Kansas. I wonder if they’re trying to clean up and revitalize Treece? People “touring” Picher may have been “harassed” by police because contrary to your report there are people who still live here. My son grew up here. He is not mentally challenged due to exposure to lead. He graduated from high school and is now serving our nation in the Army. I had to comment on this article because I’m tired of people who don’t know anything about what happened here writing articles about it. You read something on the internet ( and we all know that you can’t lie on the internet ) and decided you had all the facts. Please do more research before you post your “facts”. If there’s anything you believe is inaccurate, feel free to point it out. Even if a handful of people remain (no more than six households, according to your own estimate), that does not substantively change the story. 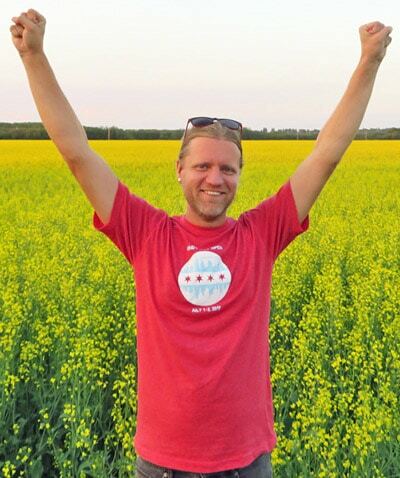 Awesome post Scott! I would love to go there and shoot photos sometime. It would be cool to film a vlog there too! Yeah, the scenery is wild. Fyi, I hear the local authorities aren’t too keen on visitors wandering around Picher. I was in and out fairly quickly but I’ve read stories of other folks being harassed by police. Fascinating story. I heard of places being wracked around the Arctic circle because of the search for resources, didn’t know it happens in places like Oklahoma – though I’m not surprised. It’s frightening that the government is aware of dangers and lets people continue living there, hoping for the best. I mean, even if they think the land can be healed and are working toward that – find a solution for your residents first. The most disturbing part of the story was the government agencies constantly reassuring residents that it was fine to live there up until 2006. It’s not good when you can’t trust those responsible for protecting you. wow, that is one spooky place! This is so creepy! And sad. I can’t believe I’ve never heard of this town. I think I’d feel like I was in the opening scenes of a horror movie if I was wandering around there alone. I only heard of this town by some fluke a while back when I was looking up ghost towns. I kept the page bookmarked because I told myself if I ever visited Oklahoma, I had to see this place. It definitely was creepy being there! i am mildly obsessed with ghost towns for this very reason. So haunting and beautiful and desperately sad. Great story. Ghost towns really are haunting Ashley. Most ghost towns don’t have many buildings left, so at least Picher has that to offer. Really great post. The opening photo really seems to capture what you describe. Thanks for writing about this. Thanks Courtenay. This place was one of the weirdest towns I’ve ever visited so I was excited to share the story. Yikes… reminds me of that town in… I want to say PA? That has the mines under it burning forever… Nice job. Glad you found me on Twitter! I haven’t heard of that one Amy, but I’ll have to look into it. I bet there are a lot of towns that have issues due to mining! I think that the town that Amy is talking about is Centralia, in Pennsylvania. I’d love to visit it, and other ghost towns, but not much chance of that because I live in the UK. Thanks for the info, Rachel! Wow it looks so eerie! It sure was Jennifer, so I’m glad the photos got that message across. Loved this story! I just read it out loud to the office. Thanks Lynn, I’m glad you enjoyed it! Fascinating! I love that first picture. It’s haunting. I drove through some towns in Alabama that were basically ghost towns due to the recession. Grocery stores and gas stations closed up shop. Every building on Main Street shuttered. It was surreal, just as you describe this, though I think people still love there. There just isn’t any business in town any more. I don’t think I would have had the nerve to cross the No Trespassing signs, but I;m glad you did. So interesting. I’ve been through some towns that might as well be ghost towns. They’re usually really depressing, aren’t they? I love ghost towns too Patrick – I’m making it my goal to see a lot more in the future! I look forward to seeing and hearing about those future ghost towns. Maybe you should check out Hinckley, CA? I don’t know if it’s a ghost town or not. That would be an interesting place to visit, Carol. It looks like there are about 2000 people still living there. I actually grew up in picher/Cardin, it was toxic even back then, we just didn’t know it. I suffer from many health issues I’m sure were caused by those living conditions. The government only got involved when it could no longer hide how unhealthy it was to live there. It’s not really a ghost town. There are people/families that still reside there. Wow… this was very interesting. Crazy the things we NEVER hear about on the news. I mean this happened like YESTERDAY… WTF??? I’m still sitting here thinking what else is going on in the USA that we don’t know? I hope these people got a good amount of money at least. Your photos are great… they look like from a movie of the end of the world. They look so scary. Yeah I hadn’t heard about this town until I stumbled across the wikipedia page while researching ghost towns. The most disturbing part is how the EPA let these people live there for decades even after they realized the area was hazardous. Thanks for the link! I’m going to hunt down that film online if possible. 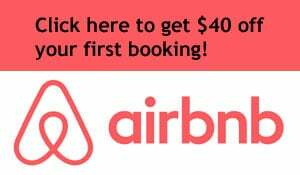 I have news for you.I live in Picher and have lived there since 2007,My mom has lived there since 2001.So please don’t tell lies of everybody got a government check for leaving.And we haven’t abandoned Picher either. So much American history lost.